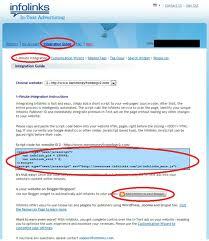 Your infolinks Account blogger content is must be useful and readable to all viewers and information guide to all. Your infolinks Account blogger content should have required videos and examples to understand viewers easily. Make sure key words are properly set for your blog content in these three parameter you need to prepare your blog or website to apply infolinks. Fist you need to visit infolinks official website and click on join us option then fill the details like your fist name and last name , e-mail address , password , and type below shown catch code then click on submit option. Then you will find options like word press , Blogger, Weebly….etc you need to select Blogger here and click on Add widget option below then automatically your blog redirected to you Blog Add widget isnt compulsory. Here complete the final step to get infolinks to your blog this step is most important and mandatory you can click on 1 minute integration registration option here you will find code just copy it and past in you blog ahead of Head tag and save go to your blog click on Template then click on edit html and paste code below of Head tag and click on Save settings button at below. Then logout from you infolinks account with in 48 hours you blog will reviewed by infolinks officials for you infolinks Account for blog.